I thought I’d share this little AppleScript for anyone working with Xcode 8.3.3 and using Swift. 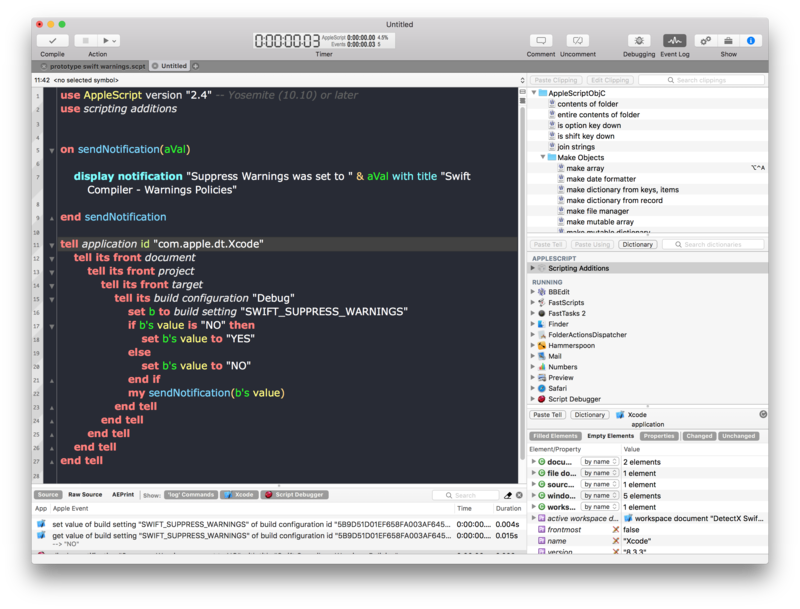 One of the things I find intrusive are the constant Swift Compiler warnings while I’m actually in the middle of writing a block of code (e.g, ‘…value was never used consider replacing…’). Well, yeah, it’s not been used *yet* …grrr! However, turning off compiler warnings isn’t something I want to do either. It’s too easy to go into the build settings, turn them off, do a bit of coding, take a break, do a bit more coding…oh, three thousand lines later and I suddenly realize why Xcode hasn’t been correcting my mistakes all afternoon! This script allows you to quickly and easily toggle the warnings from a hotkey, and just gives you a gentle reminder as to what you’ve done. Of course that won’t stop you forgetting, but assigning a hotkey for this script makes it painless to just turn warnings off and back on again as soon as you’ve got past whatever bit of code the compiler was complaining about. Xcode unfortunately doesn’t have its own scripts menu, so in order to assign the script a hotkey, you’ll need to either make it into a Service with Automator or use a script runner like Red Sweater’s FastScripts. display notification "Suppress Warnings was set to " & aVal with title "Swift Compiler - Warnings Policies"
tell its build configuration "Debug"
set b to build setting "SWIFT_SUPPRESS_WARNINGS"
set b's value to "YES"
set b's value to "NO"
I recently discovered a neat little extra automation tool on top of the familiar ones of AppleScript, Automator, and script runners like FastScripts and Keyboard Maestro. Meet Hammerspoon, which differs significantly in not using Apple Events to do many of its automation tasks. Instead, Hammerspoon bridges directly to Apple APIs using the lua scripting language, and that allows you to do some interesting things. Here’s a good example. One of the ‘danger zones’ on your mac – by which I mean one of the favourite places for adware, malware and other assorted badwares to infect – is your LaunchAgents folders. Apps like my DetectX and FastTasks 2 keep an eye on these areas by design, warning you in the Changes and History logs when files have been added or removed from them – but Hammerspoon can add an extra little ‘canary’ warning for you too. With only a few lines of code in Hammerspoon’s config file, you can set up an alert that will fire whenever the LaunchAgents folder is modified. And what’s the config file you ask? Nothing complicated! Just launch Hammerspoon, click its icon and choose ‘open config’. That will launch your default text editor, and all you do is paste your code into there, save it (no need to tell it where, Hammerspoon already knows) and then go back to the Hammerspoon icon and click ‘Reload config’. That’s it. Less than a minute’s work! There’s a lot, lot more you can do with Hammerspoon, so if you’re interested head off and check out the Getting Started guide. One of the nice things is that you can even call AppleScripts with it, so you really do have a world of automation options to choose from! Full details of DisplayDroid can be found here: http://sqwarq.com/displaydroid/ To get a free beta copy of the app, please register for the Community forum here: http://displaydroid.proboards.com and I will email you a beta copy of the app in the next few days. 1. Download EncryptMe, copy to your Applications folder and drag the icon to your Dock. 2. Select the files you want to encrypt and drop them onto EncryptMe’s Dock icon. 3. Choose a password and you’re done! That’s really all there is to it, but let’s take a moment to go over the details of Step 2 and 3. First of all, note that EncryptMe is an Automator “droplet” app. That means you use it by dropping files on it, not by clicking or double-clicking the icon (which will just produce an error message). If you want to know how EncryptMe works (or make your own), just open up Automator.app and take a look a the ‘New Disk Image’ action. EncryptMe sizes the disk image to fit the files you drop on its icon as long as you have enough free space on your drive. Secondly, take a moment to pause and think about the password options. You can use OS X’s built-in password generator or make one up of your own. However, be careful. This encryption won’t just keep the bad guys out; it’ll keep you out too if you forget the password! For that reason, you’ll need to think carefully about whether you’re going to tick the ‘Remember password in my Keychain‘ checkbox or not. Doing so gives you far more insurance against losing the password. The flipside is that anyone will be able to access your encrypted files if they gain access to your computer while you’re logged in. Leaving the box unchecked is more secure: the password you set here will have to be supplied every time an attempt to open the files is made even when you’re logged in. The bad news? Forget the password, and you’ll be in the same boat as the spooks and the data thieves, locked out of your data forever. So choose carefully here. In this post I’m going to show you how you can select a piece of text in any app and have it run in Terminal simply by hitting a hotkey. The trick is especially useful for running commands you find on websites (like this one!) in a browser like Safari or Firefox. Click through the various dialog boxes and choose ‘Install’ on the last one* (note for Snow Leopard users: the service will open directly in Automator; just do ‘command-shift-S’ to name it and save it). All you need to do now is set the hotkey. 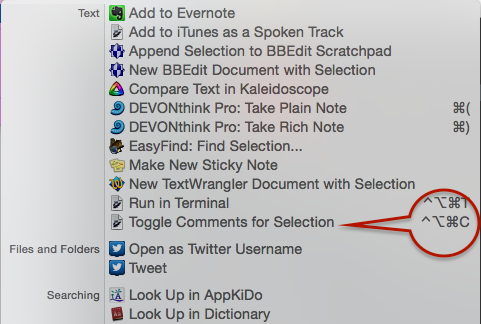 Open  > System Preferences.. > Keyboard | Shortcuts and click ‘Services’ in the sidebar. Scroll down the window till you see the ‘Run in Terminal’ command. Click on the far right to add a shortcut of your choice. The one I used in the video is ‘command-option-control-T’ (‘T’ for ‘Terminal’ helps me remember the shortcut). which lists all the visible and invisible files on your Desktop, as a test. You can also get to the Service from both the contextual menu (right-click > Services) and the application menu bar at the top (e.g., Safari > Services). As a bonus, try out your new Service on the Terminal command in this post, and now you’ll be able to run Terminal commands even from Quick Look previews in Finder! If you’re a user of Bombich Software’s excellent Carbon Copy Cloner but you’re not doing backups as scheduled tasks, you may wish there was a way to find out the last time you successfully completed a backup task. Unfortunately, CCC doesn’t provide an easy way for users to see this information natively, but in this post we’re going to add it through a bit of AppleScript and Automator magic. After clicking ‘Install’, click ‘Done’ to dismiss the confirmation dialog box that pops up. For those of you running Snow Leopard (10.6.8), after clicking ‘Open’ the workflow should open in Automator. Hit ‘command-S’ to save it as a Service. For all users, if you now click up to any application name next to the  Apple near the top left of your screen (see the screenshot at the top of this post) and scroll down to ‘Services’ you should see the new Service already there. If you don’t, try logging out and logging back in to your user account. Carbon Copy Cloner does not have to be open for the Service to work. The date format display is YYYY-MM-DD. If you want to add a shortcut key as suggested earlier, open up System Preferences > Keyboard and click the ‘Shortcuts’ tab. Down the sidebar you should see ‘Services’. Click on that and scroll way down to the bottom till you see the name of the Service. Click ‘Add Shortcut’ and hit the keys you want to use. I like ‘command-control-C’ as it’s an easy mnemonic for ‘Carbon-Copy-Cloner’. In Mavericks, Accessibility for Assistive Devices is no longer a global setting, but has to be turned on explicitly on an app-by-app basis. 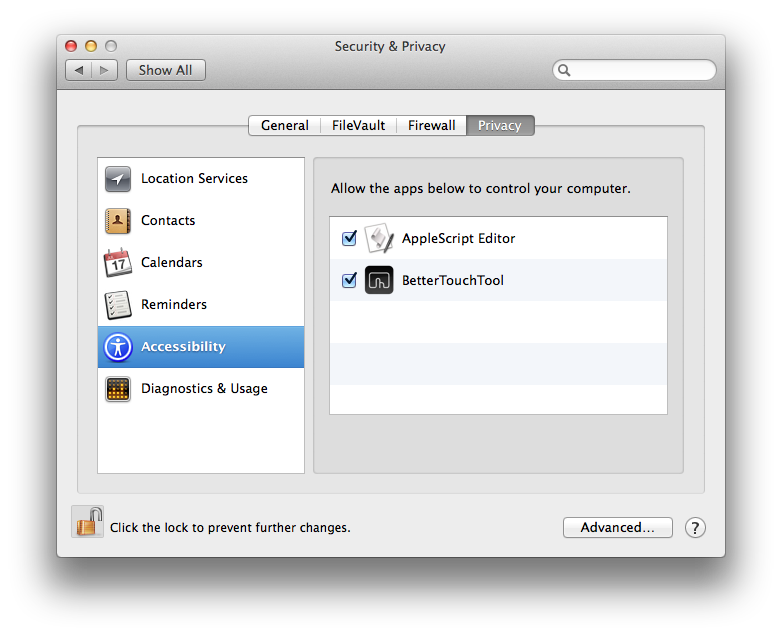 That setting has now moved to the Security & Privacy pane in System Preferences. Click the button ‘Open System Preferences’. If you accidentally hit ‘Deny’, just go to System Preferences in the normal way and choose the ‘Security & Privacy’ panel. Click the padlock at the bottom left, enter your admin password, and check the boxes in the panel for the app that’s requesting access.